For my grade 12 class we reviewed the five statistical measures with the following activity. 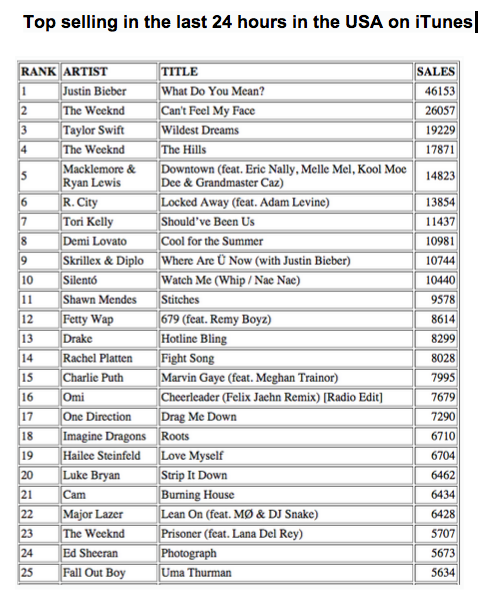 I found a website that releases the data for the top selling songs on iTunes for the past 24 hours, called Digital Sales Data. We did the activity on September 3rd which was after Justin Bieber’s new single What do you mean? was released. The students were in groups of 3-4 students and each group was given data of the top 25 selling song from a different country: USA, Finland, Australia, Malaysia, and Nigeria. Each group had to find the 5 statistical measures and we compared as a group. What was interesting was that Finland and Nigeria had similar types of numbers, The students were a little confused about if the units were in the thousands or just units as some of the data was so small. One student pointed out that Finland owns Spotify so we talked about the economies of the countries. We also talked about why the values were so different discussing the population of the countries and buying power. It would have been helpful if I had the countries’ population and GDP to compare. Overall it was a good activity that brought in a global perspective and interesting to see what types of music are listened to elsewhere and helped the students stay focused and interested. We found that Justin Bieber was the top selling in all the countries. We also were able to talk about grouped data and deciding on appropriate class grouping ranges depending on the data given and discussed the standard deviation of each set. 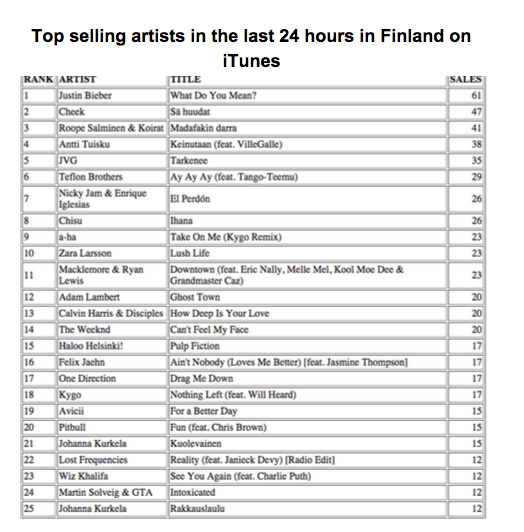 Here is and example of the data from the USA and Finland.